Our 2015 Annual Training Camp will be held on the Gold Coast on the weekend of October 30 and runs from 4pm Friday to 10am Sunday. The camp offers a unique opportunity for all members to meet and share experiences and also gives our members a fantastic opportunity to meet instructors from all over Australia, unfortunately the logistics involved in organising the National Training Camp only make it available to adult members but most regions do provide local "Club Days" to especially cater for our younger members and those members that cannot make the Camp due to distance, cost etc. At the National Training Camp our Master and Senior Instructors will provide the leadership and guidance required to ensure the camps ultimate success and we look forward to our Branch Instructors and colour belt members all benefiting greatly from their many years of experience. This years event looks like being even bigger than it has been in the past so bookings are essential, bookings close on September 1. The Camp will operate from 4pm Friday 30th October and will end at 10am on Sunday 1st of November and is open to all adult members from white belt to black belt without exception. Register NOW by securing your deposit online at our "Merchandise" page with balance of payment payable at check in. 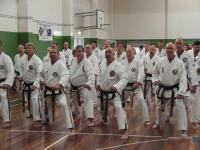 Full details are available from your Branch Instructor or by calling Master Tina Johnson on 0400530534 or emailing shimjangtkdtina@gmail.com. In this edition we ask Master Danny Wade a few questions. A: 4th Dan Regional Master Instructor. A: Jonathan Gardner 2nd Dan. A: The jumping spinning kicks look great when executed correctly but I prefer a stepping side kick, you can deliver lots of power cover a lot of distance quickly and is a good technique in a self defence situation. A: I am a service technician for a company that manufacture machinery and software for the graphics industry. A: Don't really watch much TV apart from Friday night, Saturday Sunday and Monday night footy !!! A: What little spare time I get I go running. And seem to spend lots of time and money in Bunnings. A: As I came from England 20 years ago, I like to catch up on the English premier league from time to time. I have followed arsenal since a child but here on the Gold Coast I try and go watch the Titans whenever possible.